​Manufacturing Day is a celebration of modern manufacturing meant to inspire the next generation of manufacturers. Throughout the month of October we would like to bring awareness and celebrate the economic drivers of the Twin Counties region, our local manufactures. On October 6th the Chamber will hosted the Manufacturing Appreciation Day. The was filled with activities to promote and appreciate the local manufacturers in the area. Over 400 middle students from Edgecombe and Nash county attended on the front lawn of the historic train station to learn more about local manufacturers! Edgecombe Community College, Nash Community College and North Carolina Wesleyan College were also involved and advised students of classes they can take at their colleges that can assist them with getting jobs at different manufacturing companies. Here are some highlights from our Manufacturing Day! Here is how the community can get involved. 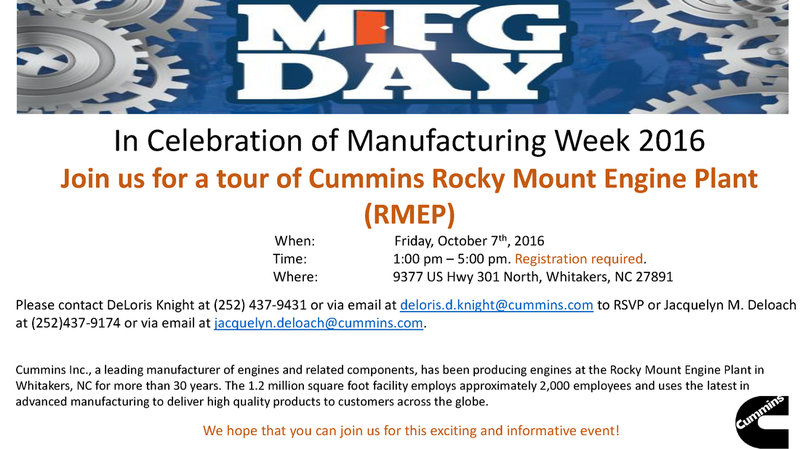 Visit a local manufacturing company; Learn what modern manufacturing facilities are like and what companies are located in your communities. Research what types of jobs are available in the community and who they sell to. Find out what skills and education are needed to qualify for a position at one of our local manufacturing companies. Support your local manufacturers; If you know someone who works for a local manufacturing company, make sure you tell them you appreciate their work. The employees of these companies help boost our local economy so that the region can still be sustained. A simple thank you goes a long way! Manufacturers we need your support too ! Host an open house or a tour; A lot of the public is not aware what you make and how important it is to our community. Have an open house to help educate the public on how important you are. Educate the community; It is important that you educate our community about what you do. This can be done through your website, social media, printed material or by talking with the public. Get the word out about your great company ! We invite our Twin Counties manufacturing companies to post information on what they are doing for Manufacturing Day. Let us help you promote your events! For more information please contact Desiree Dolberry at 252-973-1202. Why open houses and tours are important! Contact us today to add your manufacturing company tour information on our page!